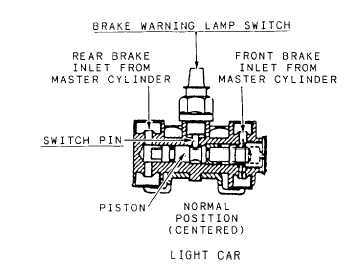 make any repairs, reset the brake failure warning lamp switch (fig. 6-7). See table 6-1 for a complete listing of possible brake problems and repairs. Aside from the vacuum booster, the same basic inspection procedures given in the hydraulic brake section apply to the vacuum-assisted hydraulic brake system. When you check this system for a source of trouble, refer to the chart for the standard hydraulic brake system (table 6-1). After you isolate possible causes by consulting this chart, check for causes in the troubleshooting chart of table 6-2. Conduct the following test BEFORE you check the cause of a hard pedal. With the engine stopped, depress the brake pedal several times to eliminate all vacuum from the system. Apply the brakes, and while holding the foot pressure on the brake pedal, start the engine. If the unit is operating correctly, the brake pedal will move forward when the engine vacuum power is added to the pedal pressure. If this test shows the power unit is not operating, check the probable causes of vacuum failure in table 6-2. A "hard pedal" means the booster is inoperative and you should suspect and check the following as the cause: collapsed vacuum hoses, faulty vacuum check valves, internal damage to the power booster, or a broken plunger stem. Uncontrolled stopping is a problem that may be caused by grabbing or oversensitive brakes. This symptom may result from a faulty power booster, a damaged vacuum check valve, leaky or incorrectly connected vacuum lines, or a broken plunger stem. Figure 6-7. - Pressure differential valve with brake tamp warning switch. When you apply the brakes and they fail to release, the following could be the problem-a broken power booster return spring, a sticking valve plunger in the booster, or a jammed power piston. Loss of brake fluid may occur through the rear seal of the master cylinder past the piston stop plate and into the power booster. The leak is not visible on the backing plates, the wheels, or the frame because the fluid collects in the power booster. Some of the fluid may be drawn through the vacuum lines and burned in the engine. The end result is that you do not see the leak. For a more complete listing of vacuum booster hydraulic brake problems and remedies, see table 6-2. Always consult the specific manufacturer's manual whenever you replace or repair any vacuum power booster.